Our art tape is better than a magician's magic wand. It is reusable, repositionable, low tack and made in the USA. 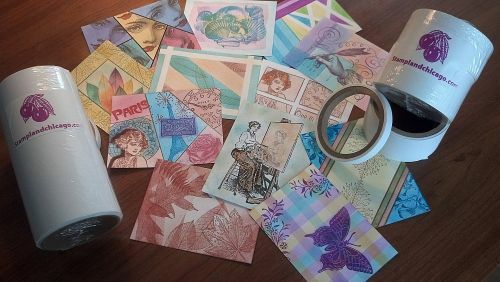 The tape is available in a seven inch roll that is perfect for masking any size stamp, and in a variety pack of three versatile sizes. Use the tape to make masks that stay in place, anchor your templates and reverse images with ease. See Darlenes video, COLOR CONVERSATIONS, for instructions on how to use STAMPLAND ART TAPE and BUFFY BRUSHES to create mosaics, grids, gradations, plaids, shadow boxes and frames. It is easy and fun and the results are amazing.